The past few months I kept pulling a card from Doreen Virtue's Ascended Masters deck, one that tells us to work with crystals, but I didn't know how to go about it. Then in November, I joined a spiritual circle where we study a different topic each week. Most of the lessons are taught by a friend from grad school, though each of us presents a subject they we passionate about. Clearing Newbies. Crystals radiate healing energy though they are also quite sensitive, absorbing vibes from their surroundings. It's important to clear them before we use them because all crystals have a past, even if it only involves recently cut crystals being handled in a store before we bring them home. I learned to clear crystals by placing them on a bed of salt or brown rice for an hour or so, and letting that clear their energy. There are other ways to clear them: running them through water, or placing them in sun or moonlight. Some crystals can lose their shape or color this way so its always a good idea to check before letting them soak. As far as I know, rice isn't harmful and salt only affects a handful of stones. Don't leave them "clearing" for too long, however, as that can diminish the stone's properties. Charging Them. Whenever we clear a space we have to fill it with light, whether its a crystal, a house or a Chakra. Hold your crystal in your hand and visualize white light coming down from the Heavens, through your Crown Chakra, down your column, through your heart to your hand and finally to your crystal. Fill it with light and if you'd like, give it a specific intent. Ask that it work for your highest good and healing. 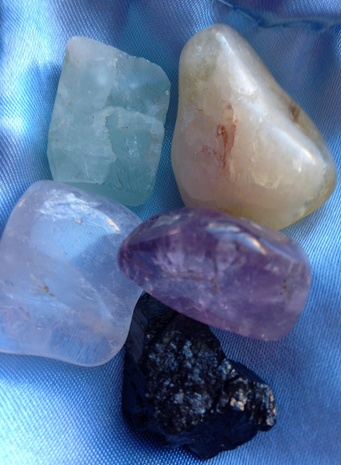 Specific crystals can be programmed for love, prosperity, healing, abundance, forgiveness, etc. There is a great book by Lisa Chamberlain called Wicca Crystal Magic that goes into this in detail. Quick Cleanse. Crystals are often used for healing. You might hold a crystal in your hands and meditate, or lie down and place a variety of crystals on your Chakras. It's good to clear them after each session by running them under the tap for a few seconds. This is especially important if we use crystals for healing ourselves or others, as they absorb our personal energy. This quick cleanse prepares the crystal for the next session. One of the crystal healing classes I attended a few weeks ago was about quartz crystals specifically, and how we can charge them for daily use. It was taught by a fantastic Healer named Claudia Lechuga that I met after moving to Mexico (this is her Facebook Page!). She taught the cleansing methods I mentioned above, and also gave us a set of basic crystals to carry with us everywhere we went: fluorite to boost our intuitive learning skills, citrine for abundance, amethyst for its magical properties, clear quartz for clarity, protection and intuition and black tourmaline for grounding. I am hoping to add my own carnelian tumbled stone for courage! For some reason, I have always resonated with Amethyst Crystals. Maybe its because the translucent purple stone is associated with Aquarius, my sun sign. Now that I know more about crystals, I love the purpose you can give amethysts: intuition boosters, psychic protection and best of all, the fact that amethysts transmute negative energy and let love take its place. That's why I really dug the meditation that we learned in our circle a few weeks ago. It consisted of placing amethyst crystals on different points in the body (20 in total) and one rose quartz on the Heart Chakra. The idea was to program these with the intent to release a particular emotion, be it sadness, grief, jealousy, regret, etc and replace it with love. Since then I've tried it again at home, placing a Rose Quartz stone on my Heart Chakra, and Amethysts on the other six Chakras (Root, Sacral, Solar Plexus, Throat, Brow and Crown), as well as one amethyst in each hand. All you have to do is lie down for 10 minutes and visualize those crystals emanating light, clearing your Chakras and your energy field. Focus on your breath throughout, and end by grounding and protecting yourself (see here).